 Electric vehicles (EVs) are less expensive to operate and own than the now outmoded combustion engine cars. Electricity is cheaper per mile than gasoline, and electric motors are way more efficient at moving you down the road than combustion engines (a motor wastes very little fuel energy as heat, an engine wastes a lot).  EVs are capable of being much safer than combustion cars... there's no engine under the hood that can be pushed into the passenger compartment in a crash, plus there's all the safety and anti-collision technology that takes advantage of an EV's design.  EVs have far less moving parts than combustion cars, so less to break and much less maintenance; change only tires and wiper blades, no oil changes, belts, hoses, fuel and oil filters, spark plugs, fuel injectors, timing chain, oxygen sensors, muffler, radiator and transmission fluids, etc. Even brake pads and rotors last a lot longer because electricity generated by the motor helps to slow the car down.  EVs take 12 seconds to charge: 6 seconds to plug it in when you get home, and 6 seconds to unplug it the following morning... less time than a gas station visit.  Just as cell phones now have "Turbo Charge", the modern lithium-ion batteries in EVs can be charged very fast at charging stations equipped with fast chargers, and there are plenty of them. And there are EVs designed from the ground up allowing for large battery packs, so no "range anxiety" on long trips (especially if your EV automaker provides a worldwide charging infrastructure). EV technology is now commercially viable, thanks in large part to the kick in the automotive industry's pants by Elon Musk and Tesla Motors. Affordable mass market EVs require economies of scale, and this requires adoption. So when there's a choice between a gas powered car and an EV, and the prices are close, we as tenants of this planet have an obligation to give serious consideration to the environmentally friendlier, non-harmful option. Q: But aren't the emissions still mostly just moved from the road to the coal-fired power plant when switching from a gasoline car to an EV? 1. Because of economies of scale, one gigantic power plant serving 1000 electric vehicles can be more efficient than 1000 separate power plants (one in each gasoline powered car). Think about what it would look like if you collected all the tailpipe emissions in a huge bag from a gas fueled car driven 100 miles. Now imagine the additional smoke stack emissions from a power plant that's charging an EV's battery to replace the energy it just used for a similar 100 mile drive. The difference is like night and day, for reasons #1 and #2. 2. 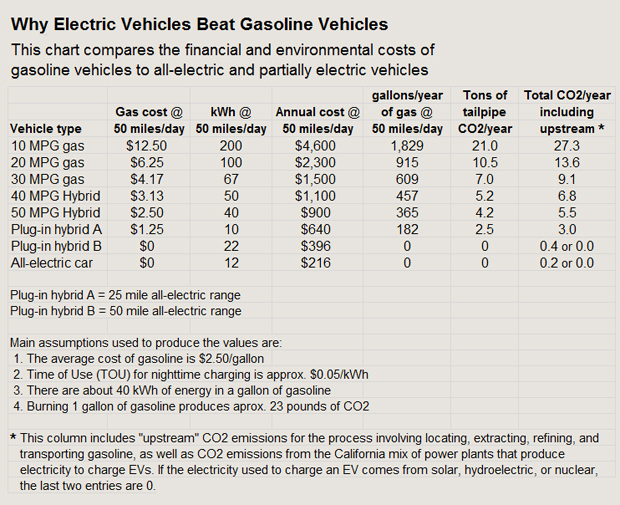 An average gas powered car can get 24 MPG, but an EV can get three to four times that in MPGe. So, much less fuel energy required for those 1000 electric cars than for 1000 gas powered cars driven the same distances, resulting in much less emissions. 3. The emissions from a power plant can be "scrubbed" to reduce air pollutants and CO2, but this is not feasible for a fossil fuel car. 4. Petroleum refining plants require lots of electricity to turn crude oil into gasoline. Since this energy production is unnecessary with an EV infrastructure, this needs to figure into a "well-to-wheels" analysis when considering emissions. 5. And remember, coal-fired plants can have fields of solar panels added to them to reduce the amount of coal they burn (already being done). And in the future they can be replaced by renewable energy power plants. So your electric car runs cleaner as infrastructure improvements are made! And if solar panels and an energy storage system are added to a home or business (already being done), an EV can be recharged from the sun, or from other zero emission sources, resulting in a "Zero Zero Emissions Vehicle". And how about that, Tesla has pioneered these too! "The data show that cars with internal combustion engines were not clean in the past, are not clean today, and will not be clean in the foreseeable future. The auto industry will always find new ways to circumvent tests and optimize results. The only way to ensure cars are truly clean is to accelerate the shift to zero-emission technology and electromobility."